Several years ago there was a bestselling T-shirt that said, "Jesus is my homeboy." Maybe you've crafted a picture of Jesus that is simply that of a divine affirmer. This Jesus never lovingly confronts you with the law in order to draw you back to the Gospel, but is only there to say, "I got your back, buddy!" Maybe you've noticed that some have transformed Jesus into a political trump card to be conveniently laid out as a means of winning arguments and shutting down debate on social media. Or perhaps you've seen him portrayed as the "genie for the faithful." You know how this Jesus works. If you pray enough, believe enough, or just plain try hard enough, Jesus will grant your wish for a spiritual breakthrough. Or maybe you've recently heard someone has transformed Jesus into the likeness of a simple, first-century guru. Nothing more. This is why we need the transfiguration. This is why we revisit this familiar territory. We come back to this particular storyline because in the last year we've built a false picture of Jesus. We've laid our assumptions, our agendas and our designs upon Jesus. We've sat with him -- knowing that there is more than meets the eye -- and tried to turn Him into something that suits our fancy. Saint Mark reminds us of who Jesus really is and who we need Him to be. Jesus is not just a great teacher. He is greater than the great teacher Moses and the great prophet Elijah. They bow to Him. Jesus is not just an enlightened man. He's God in flesh and his glory shines brighter than clothes could ever be bleached. He's not your card to be played in arguments or puppet beholden to your commands; He's the Father's "beloved Son." We listen to Him. He rules over us. Every once in a while we need Him to bust out of whatever box we've placed Him into, transform into His glorious self, and remind us that He is the one true God. No need to throw out the chocolate, booze, and carbs. Pope Francis has a different idea for fasting this year. Christians around the world mark the beginning of Lent with the celebration of Ash Wednesday. This ancient day and season has a surprising modern appeal. Priests and pastors often tell you that outside of Christmas, more people show up to church on Ash Wednesday than any other day of the year—including Easter. But this mystique isn't reserved for Christians alone. The customs that surround the season have a quality to them that transcend religion. First, giving up something allows me to make a tangible sacrifice to the Lord. Although certain sacrifices are already present in my life, they’re sort of “built in” at this point. I don’t often experience giving up something for God on a daily basis. The act of sacrifice reminds me of my commitment to God and my desire to make him first in my life. Second, by giving up something I usually enjoy on a daily basis, I have sometimes found myself yearning for that thing. Frankly, I’ve been tempted to give up my Lenten fast at times. I could easily argue that it’s unnecessary (it is optional, after all) and certainly not taught in Scripture. But, though I don’t think my effort at fasting makes God love or bless me more, I do think it raises my awareness of how much I depend on other things in life rather than the Lord. I see how easy it is for me to set up all sorts of little idols in my life. Fasting, in some way, helps me surrender my idols to God. “Blessed are the poor in spirit, for theirs is the kingdom of heaven. . . .
Of course feeling hungry for one of life’s pleasures isn’t quite the same as hungering and thirsting for righteousness. But when I feel my hunger, when I sense my neediness for some other thing, I can use this to get in touch with my hunger and need for God. Fourth, as I continue with my Lenten fast, I find myself less eager for the thing I’ve given up. Ironically, this makes my fast easier. It’s almost something I can take for granted, thus dulling the spiritual impact of the fast. But I’m also gratified to know that one of my little “idols” is being set aside in my heart, as I learn to depend more upon God. I’m experiencing a bit of freedom that makes me gladly thankful for God’s grace at work in me. 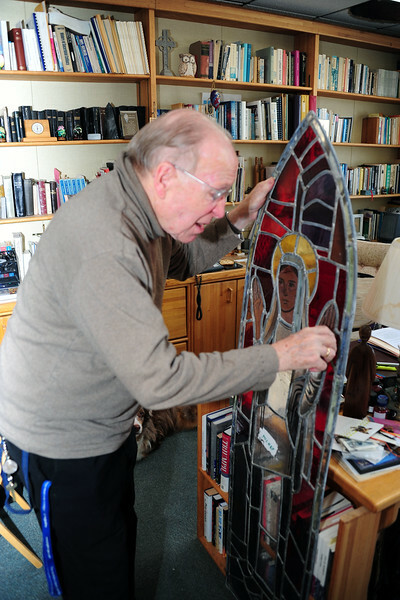 Above Father Philip repairs the donated stained glass from the Chapel of the Novitiate in Marcy, New York. The Chapel was the place were many US Marianists prepared for their profession of vows. 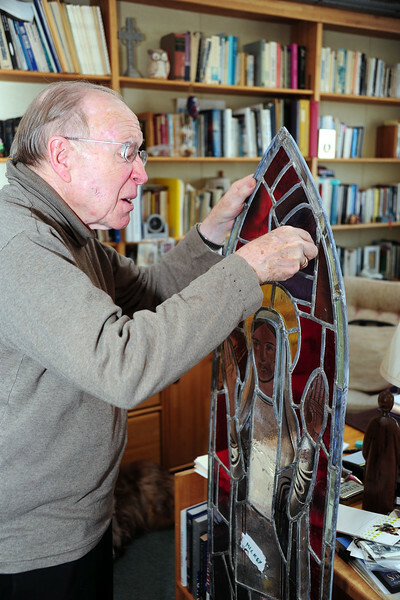 The benefactor donated the many stained glass windows which will be installed in various parts of the Marianist residence and school. The third new window for this world out there is a new stained-glass window, the stained-glass window for the 21st century -- the computer screen. This new world will not get its inspiration from carefully manufactured stained glass windows. Today, however, the way people carry on the fastest communication and obtain their most important information is no longer from the pages of a book or a colorful window. Instead, our postmodern culture is turning toward a new kind of stained-glass window for one of its sources of light. There is a very good chance that you look at that "window" at some point every day. When you boot up Microsoft Windows '95, what is the first visual you see? The colored panes of a software stained-glass window. Christianity is now undergoing a visual metamorphosis. Our image of images must be altered. I grew up in a world where texts were better and images, or pictures, were held in lower esteem. A book with pictures in it was inferior to one without pictures. In fact, if you had a lot of pictures in your book you had a (gasp!) "coffee table" book. Christians of the 21st century will be Christians who experience God in a variety of ways, including a sensory web made possible through powerful new visualization technologies. Lent is traditionally thought of as a special period of time, once again forty days, set aside for introspection, self-denial, prayer, and study as the events of Passion week and Easter Sunday approach. As Christians we should find ourselves journeying towards the cross, drawing nearer week by week. The focus of this week's texts startle us with the suggestion that this is not a human journey only, but that all of creation accompanies us. Plants, animals, the entire earth itself, join with humanity on this spiritual homecoming, through the covenants established between God and creation eons ago. To paraphrase a well-known marketing truism: The three most important things about Lent are: location, location, location. That new, most important location to which Lent brings us. . .is the forgiveness and mercy of God. It is not good luck that God gives us; it is grace and peace. It is here in this new location that Christians, humbled by their neediness, are unshackled from their spiritual bonds and set free; it is here that children of God are reminded of the unconditional nature of God's love; it is here in this new location of unfathomable forgiveness that we truly can begin to "rest in peace." "Yet even now, says the Lord, return to me with all your heart ... rend your hearts and not your clothing." We know that a strong heart is the result of exercise, good diet and lower stress. The same is true of our spiritual lives. Lent calls us to exercise our hearts through acts of prayer, study and devotion that bring us closer to God. Lent calls us to embrace a healthy diet of the daily "bread of life" in our lives through worship and communion. And we lower our stress when we remember that, ultimately, God's the one who rules the world and is coming back not to take us away, but to take over. When our hearts are anxious and fearful, it's a warning alarm that we're not living with God's future for us in mind. Lent calls us to focus on spiritual heart health! Written in 1989 by Dawn Rodgers and Eric Wyse, this modern hymn was first introduced at Christ Community Church in Franklin, TN. Artists, including Selah, Phillips, Craig & Dean, Travis Cottrell, Kathy Troccoli, Kari Jobe, Anthony Evans, Women of Faith, Kim Hill, Susan Ashton, ZOE Group, Steve Camp, Jeff Berry, Accapella, and Katie Giguere have recorded the song. “Wonderful, Merciful Savior” reached #1 on the Christian Inspirational Radio Chart in 2001, and was nominated for a Gospel Music Association Dove Award in 2002 for “Inspirational Recorded Song of the Year.” Many worship resources contain this song, including The Christian Life Hymnal, Baptist Hymnal, Songs for Praise & Worship, “WOW Worship,” and online at Praise Charts and WordMusicNow. In just a couple of days the Christian Church will celebrate Ash Wednesday. Ash Wednesday is the day in the Christian year that's most intentionally designed to make us check our spiritual alarms. It's the day we're reminded that we're all terminally ill with the disease of sin and mortality as we get marked by an ashen cross on our foreheads and hear the words, "Remember that you are dust and to dust you shall return." In a few short weeks we'll be reminded that God has provided us a cure for this disease made possible by Jesus the Great Physician, who died and rose again to wipe out sin and death. But if we want to access the full healing benefit of that future hope of resurrection, we need to pay close attention to the alarms that are going off in our sin-diseased lives right now. The Ash Wednesday reading from the prophet Joel is full of such alarms, which makes the beeping and chirping of the hospital room sound tranquil by comparison. Joel is writing to the people of Judah in the wake of a devastating plague of locusts that has overrun the land, which, for the prophet, is a microcosm of the final judgment of God: the "day of the Lord." The warning alarms to get ready for that coming day are shrill and require immediate attention. Special days have a way of leaving some folks feeling not so special... Holidays do this when their approach builds expectations of a joy whose arrival can't be guaranteed by a particular date on the calendar. One of those days is around the corner on this coming Saturday:Valentine's Day. The church calendar no longer commemorates St. Valentine. 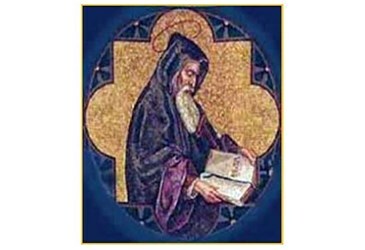 When February 14 falls outside of Lent the church marks it as the memorial of Saints Cyril and Methodius. The story of how this day came to be the occasion of love letters, flowers and chocolates is historically unclear but interesting nonetheless. Valentine's Day may be for lovers but not all loving and lovable people will find cards, roses and sweets at their door. For some this will be one of the happiest days of the year, for others one of the saddest. Any day that puts our hearts in the spotlight will be a day of mixed emotions. Those whose hearts are burdened or broken may look at February 14 as simply a day to be endured. It's unfortunate that Valentine's Day is so closely, almost entirely associated with romantic love. There are so many kinds of love that people share, love whose source and sustenance is deeper and greater than an arrow from Cupid's bow. The Valentine industry may boom this week but soon enough the roses will droop and the heart-shaped boxes will be empty. When the trappings of the day are behind us, those who know and share a deeper kind of love will have something that cannot be bought in a store, ordered from a florist or made by Godiva. Today’s Gospel shows us Jesus Who, after having preached on the Sabbath in the synagogue, heals many sick people. To preach and to heal: this is the principle activity of Jesus in His public life. 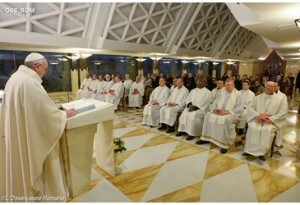 With the preaching He announces the Kingdom of God, and with the healing He shows that it is near, that the Kingdom of God is in the midst of us. Entering into the house of Simon Peter, Jesus sees that his mother-in-law is in bed with the fever; immediately He takes her by the hand, He heals her, and raises her up. After the sun sets, when, since the Sabbath is over, the people can go and bring the sick to Him, He heals a multitude of people afflicted by maladies of every kind: physical, psychological, and spiritual. Having come to earth to announce and to realize the salvation of the whole man and of all people, Jesus shows a particular predilection for those who are wounded in body and in spirit: the poor, the sinners, the possessed, the sick, the marginalized. So He is revealed as the doctor both of souls and of bodies, the Good Samaritan of man. He is the true Savior: Jesus saves, Jesus cures, Jesus heals. That reality of the healing of the sick by Christ invites us to reflect on the sense and meaning of illness. This reminds us also of the World Day of the Sick, which we celebrate next Wednesday, February 11, the liturgical memorial of the Blessed Virgin Mary of Lourdes. I bless the initiatives prepared for this Day, in particular the Vigil that will take place in Rome on the evening of February 10. And here I pause in order to remember the President of the Pontifical Council for the sick, for health, Archbishop Zygmunt Zimowski, who is very sick in Poland. A prayer for him, for his health, because it was he who prepared this Day, and he accompanies us in his suffering on this Day. A prayer for Archbishop Zimowski. The salvific work of Christ is not exhausted with His Person and in the arc of His earthly life; it continues through the Church, the sacrament of the love and of the tenderness of God for humans. Sending His disciples in mission, Jesus confers on them a double mandate: to announce the Gospel of salvation and to heal the sick (cf. Mt 10:7-8). Faithful to this charge, the Church has always considered helping the sick an integral part of her mission. “The poor and the suffering you will always have with you,” Jesus warns (cf. Mt 26:11), and the Church continuously finds them along her path, considering those who are sick as a privileged way to encounter Christ, to welcome Him and to serve Him. To cure the sick, to welcome them, to serve them, is to serve Christ: the sick person is the flesh of Christ.